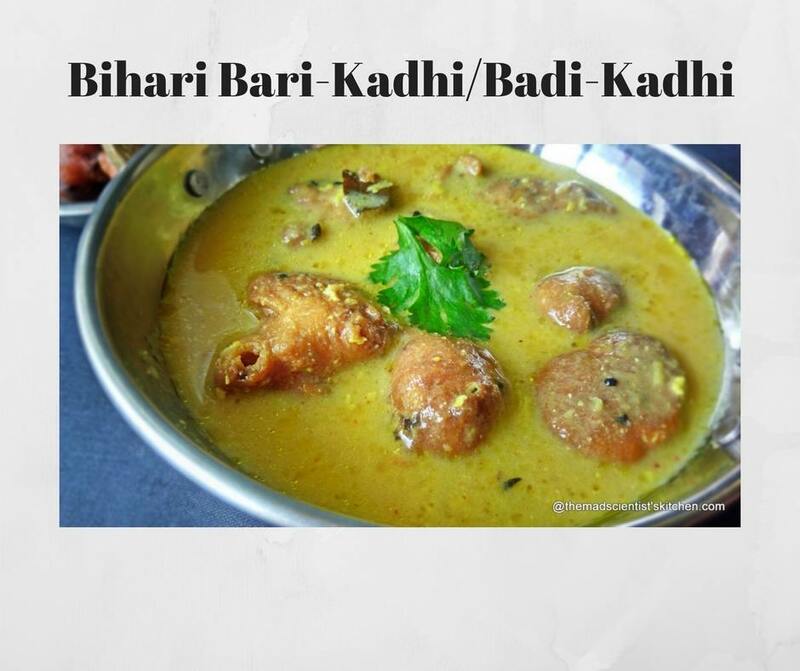 Bihari Bari-Kadhi /Badi-Kadhi Recipe is a delicious and yummy dish from Bihar that tastes best with steamed rice. As food in Bihar is seasonal, Bari-Kadhi is generally eaten in summer. The accompaniments along with rice are dry stir-fried vegetable along with chutney and pickles. For December 2017, we are making recipes from Bihari cuisine for “Ssshhhh Secretly Cooking.” Sara of Sara’s Tasty Buds is my partner, who choose Besan and curd as my secret ingredients. However, what is Bihari cuisine like? The cuisine of Bihar is quite similar to North Indian cuisine but has an influence from other East Indian Cuisine (for example like Bengali cuisine). Bihari cuisine is predominantly vegetarian because traditional Bihar society influenced by Buddhist and Hindu values of non-violence did not eat eggs, chicken, fish and other animal products. However, there is also a tradition of meat eating and fish dishes. The food here is highly seasonal, and the Bihari thali changes every 3–4 months. The only constants are rice, roti, achar, chatni, dals and milk products with some variation. Dairy products are consumed throughout the year, with common foods including yoghurt known as dahi and buttermilk are known as mattha, and lassi, butter and ghee. Foods such as watermelon and Sherbet made of the pulp of the wood-apple fruit are eaten mainly in the summer months. Preparations made of sesame seeds, poppy seeds in the winter months. People use both vegetable oil or mustard oil and jeera or panch foran (literally “five seeds”, namely saunf or fennel, rai or mustard, methi or fenugreek, ajwain or caraway seeds and mangraeel (Kalaunji) or onion seeds for “chhounkna”/”Tadka” (tempering) of some vegetables. There is a lot of light frying, called bhoonjnaa, in Bihari food. One of the most remarkable things about this cuisine is “smoked food”. It refers to using smoked red chilli to infuse a strong aroma into the food. Used in preparing “chokhaa”, i.e. mashed brinjals/potatoes/tomatoes, either single or combined. Now add Badi or Bari Kadhi to the list. The main ingredients for Bari Kadhi are besan or gram flour and yoghurt. 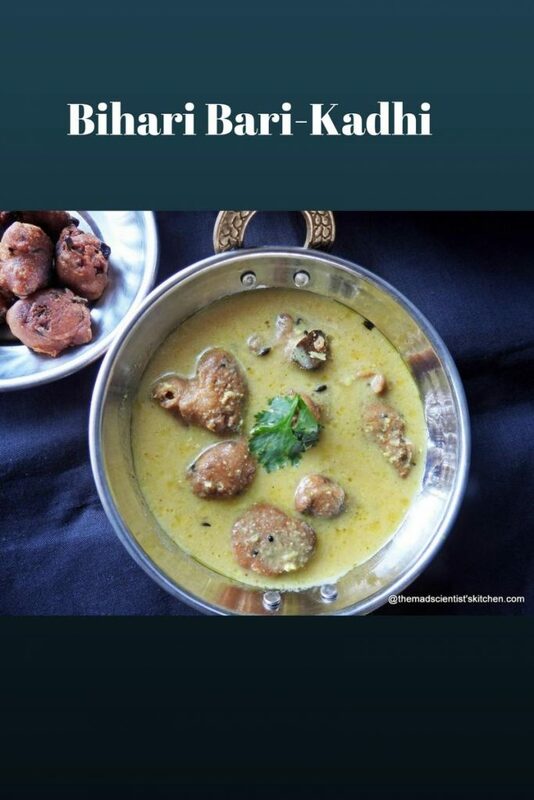 Bari Kadhi is similar to Punjabi kadhi and Kadhigole in Maharashtra yet different. In a big bowl mix the besan, ajwain, kalonji, turmeric, red chilli powder if using, onion and the cooking soda with water to make a thick batter. Heat oil in deep kadhai/wok. Drop a small test ball into the oil. If the ball rises to the surface of the oil gradually then you can add more balls of the dough. If it rises immediately your oil is too hot. Cool it else, your badi will not cook inside. Drop small balls of the batter in the hot oil. I used my hands but you can use 2 teaspoons to do the job. (Add small balls as they will swell in the oil). On medium flame fry until deep golden brown. Drain and set aside on absorbent paper. Mix the curd, besan ginger-garlic paste, black pepper powder, cumin powder, coriander powder, turmeric powder, red chilli powder and 2 cups water. Add more water if you want a thinner kadhi. Whisk so that there are no lumps. In a deep pan heat oil add the jeera/cumin seeds to splutter. Add the red chilli, curry leaves and the green chillies. Add the kadhi mix stirring constantly. simmer on low flame for 15 minutes. Put the badi in the simmering kadhi. Cover and cook for 5 more minutes. 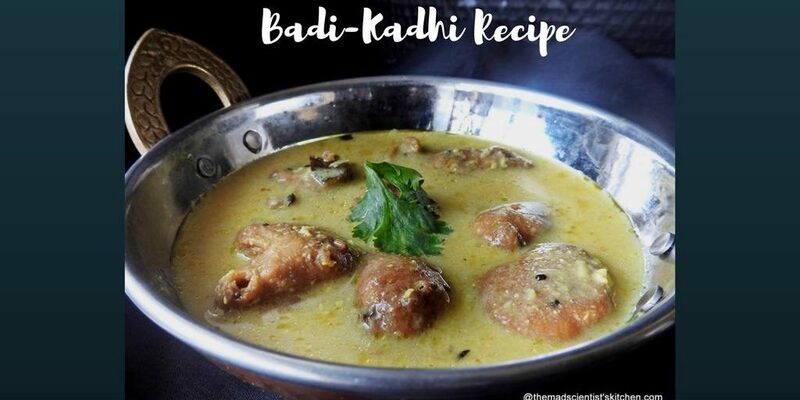 The bari or badi means fried soft dumplings made of besan/gram flour cooked in spicy gravy of yoghurt and besan called the kadhi. 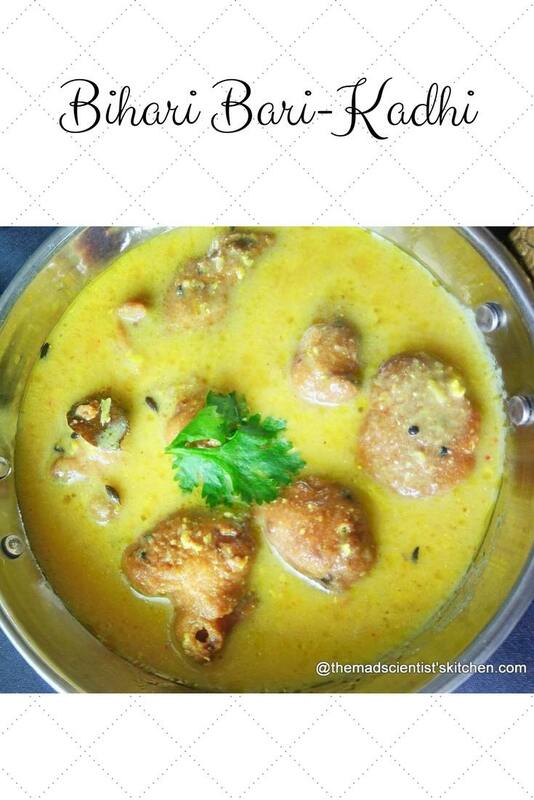 A delicious Bihari dish. The Bari kadhi from Bihar cuisine is so inviting ! The Bihari bari- kadhi looks so inviting and delicious ! Interesting facts about the cuisine, Archana. Also one more variety of kadhi added to my list to try out soon. Welcome to the group. The name kadhi makes me drool. 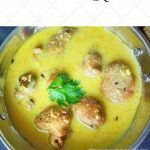 This Bihari style kadhi looks very delicious, bookmarking to try soon. Always my fav with some hot rice.. Delicious!! Absolutely loved this recipe Archana! Learnt another way to make one of my fav dishes. I can have this Kadhi anytime, so comforting, and delicious,loved the recipe. This Bihari Kadhi looks and sounds amazing.I love the flavours and spices you have used. First I thought it would be same as Punjabi kadhi, but when I saw ingredients,I saw there is a garlic in there..must be incredibly tasty. I got to make one day. Will love to hear your feedback and of course your pics. Bari kadi from Bihar looks delicious. Tastes good with hot steamed rice. The best combo in the world. True making and keeping off the bari is difficult. Looks delicious arch! I m craving for some yumm kadhi now, this looks like a nice change for the usual ones we Do!! It is yum Priya even hubby ate this. Wow, such a droolworthy Bihari bari kadhi, my mouth is literally watering here. Too tempting Archana..